In 1973 on 23rd June we arrived about lunchtime in Lahore and despite the bloody climate the temple was impressive and we found a large, modern well-laid out progressive city far superior to New Delhi although climatically just as horrible with its intense heat and dust and the Pakistanis were nasty – leery and lecherous. Border formalities were onerous and took five hours after a sleepless night in a noisy dark bungalow where tractors ran through the grounds all night and sirens went off every hour. So I collapsed in the air-conditioned room and slept all afternoon. Ate in the same hotel to avoid going out into the street and to bed early. Shared a bed with Eileen. Spent all the next day getting Eileen to a doctor because the others were unhelpful. Swam in a lukewarm pool at the Intercontinental hotel for five rupees and left in the evening traveling all night on a bumpy, noisy horrible road full of lumbering smelly trucks. 24th June through Rawalpindi and Peshawar. Well we arrived at the Pakistani-Afghani border at some time and nothing eventful happened – just a seemingly interminable border wait as usual. I can’t remember where we camped but the country was incredible. We travelled up the Khyber Pass. It was as barren and dry and harsh and rugged as I had expected and the town near the top was inhabited by people who look like – and apparently are – brigands and bandits. They looked wild and frightening. The whole of the Khyber Pass is edged by watch towers and fortresses so it wouldn’t be possible to traverse it if the locals (men) didn’t want you to. We were warned by the drivers that we may be robbed. I wonder whether they paid bribes or whether we just looked so appalling and scabby they weren’t interested in robbing us. More impressive in majesty but less known in history and by travellers than the Khyber Pass is the Kabul Gorge. This is the most breath-taking range – probably 12,000 feet high with snow covered peaks. Freezing night but the views were wonderful. The approach to Kabul was everything it ought to have been – Caravans from James A. Michener – Afghanis and camels – women in gaily coloured dresses – wheat being threshed by the hooves of cattle walking in circles – black tents – dignified turbaned men – herds of goats – golden and green colours. Altogether fantastic, welcoming and seductive. Nice to get letters last night. Hot here but very dry so it’s possible to walk if you want to but walk slowly. The shopping market has many small specialised shops and stands of shirts, jewellery, leather, fruit drinks of carrots, peach and apricots, cherry mulched up before your eyes and poured into long glasses for five cents each and then leather coats, bright embroidery and bargaining which is great fun. Dinner last night in a crazy hippy restaurant on fruit salad and yoghurt after bargaining for a frock for Ilze which was reduced from 350 to 150 afghanis. Drank tea in small glass cups and flirted and bargained for about three hours. Great fun. Today I walked myself around sightseeing. Others slept all day. Local bus was also full of local chat and interactions and just fun – a word I seem to use a lot in Afghanistan. Special dinner tonight made by the family we stayed with – it too was fun and brought us all together as a group. Afghanis are hospitable and happy to be with. Guesthouse is opposite the British Embassy and the family open and delightful. Perhaps they are normal and we are not after our travels. We left early and also left Eileen behind because she was not feeling well. 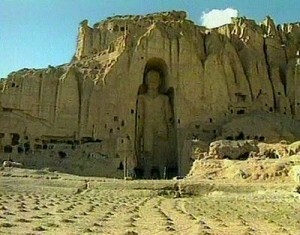 Bamiyan is where Buddhist refugees came 500 years ago and built a monastery in the form of cells in the sandstone cliffs and also carved two huge elongated characteristic buddhas into the rocks. There is a small town here. Again I was immensely impressed by the Afghanis – their dignity and self-respect and self-containment yet never fail to offer tea and hospitality. The road was wild and dusty and we were filthy when we arrived at sunset because it settled all over us. There were freezing cold showers but they were worth it. Cooked dinner first and had of lots of meat which was very strong, gamey and probably goat. Arose and sunrise and walked to the top of a hill in the cold mist of the morning along a poplar lined drive to another hill and watched the sunrise across the Buddhas and drank hot black tea. Into the truck and on to Band-i-mere. Now in the “outback” of Afghanistan and to a magnificent but strange deep copper blue lake with water so cold and clear running over its self-formed staganite side that you cant see the water. Strange. Little water mills down the sides with huge stones and people bring their grain to be ground here. It must be associated with folklorique and mystery in local minds. Camped back near Bamiyan and then for a half-day on towards Kabul but found there had been rain during the night and the dirt road had collapsed about 1000+ feet into the gorge. Trucks were lined up and the estimated time to repair the road was three days. It was a terrifying road for landslides with evidence every few miles of slides into the valley. So when we camped last night under overhanging rocks and on stones, I had a sense of “well if my time’s up, that’s it:”. But it was ok. We travelled a long and tiring day along an almost deserted detour – the other trucks took a more popular road. We wound over a high plateau and down into dry deserted gulches and then to tops of mountains which were snow-capped and finally into a fertile valley where we camped just off the main road. We found the main road into Kabul in two hours and collected Eileen and the main food then had a long drive through the desert and to a dry camp. The desert was stoney and monotonous with hots winds but a bitumen road build by the USA. We passed occasional nomads with camel trains or donkeys and packs. Children were riding and men and women were walking. They all saluted us and passed on. In an occasional valley farmers have camped and are harvesting sparse grain crops. Grazing goats. Small but beautiful sunrise, wild flowers in yellow and blues and purple and red poppies, bleached cereal grains and desert. Glass blowing in Kandahar where we had a two hour stop for lunch and provisions. Again extremely hot and I feel as though I am deep in the heart of the whole world. There are magnificent nuts and raisins – other dry fruits as well as fresh for sale. Again, the people have immense dignity and there is the feeling of the nomads of the Russian steps although we are so far from Russia. There is almost no communication network in the country either due to a plan, or simply lack of development. If a revolution were to occur only the main towns would know as people live in valleys separated by towering sharp mountains. There are two bitumen roads and few others. Forced into an air conditioned café for a break from the heat. The whole country has a strangely untouched feeling as if tourists skim over the surface really knowing nothing about it. Arrived and was charmed. A flat sprawley town with fewer of the undesirable Western trappings than in Kabul. The market was fabulous with hand glass blowing, leather and metal work. There was a Noon Day Gun, and to a mosque where blue tiles are made. Saw tyre soled shoes. Really love the town and would love to return. Well still suffering from shock after seeing the two young French fellas about to be locked away for ten years or more in an Iranian prison. Police seemed really unpleasant and Iran, as a country, feels false. Another dry camping spot. Stinking hot. Slept on more stones. Khyber Pass Photo by James Mollison. 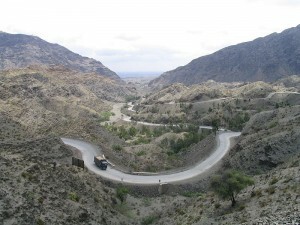 Taken at the site where the Khyber Pass starts to climb high into the mountains, Looking back towards the Pakistan side, August 2004. Interesting, no wonder she felt an immense sorry when she returned to a far different atmosphere. Thanks for putting this out there Garry.